In San Francisco, SLP Laura Thornton, and SLP Betsy Chafcouloff worked together for two years treating geriatric patients in need of swallowing and speech-language therapy at a skilled nursing facility. Laura also currently works in San Francisco schools with the deaf and hard of hearing. 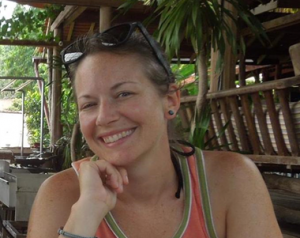 Laura is our pioneer volunteer, and came over to Cambodia only six months after we started. She has come back twice more since then. Things are going really well here. I just spent the last three days going to the hospital on my own as Betsy traveled north to Siem Reap to meet with the director of nursing at the Children’s Hospital there. 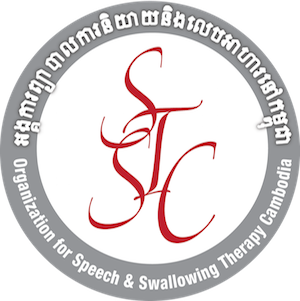 I was in charge of doing an introduction to speech and language with the doctors (Betsy has been teaching swallowing) – I had prepared PowerPoint presentations and handouts – it went really well! I like teaching. The doctors (and one PT) are great students – despite being distracted by all their patients and work, they ask a lot of great questions and try anything I ask them to. They are very interested in learning and that’s obviously what makes for the best students! Over the three days I was on my own I slowly did more and more “getting out”. The first day my big accomplishment was just getting a tuk-tuk to the hospital (not the easiest thing as the drivers don’t speak English and even if they know what you’re talking about they may not know how to get there), gathering the doctors for the class—they are typically all over the hospital and very busy— giving my lecture, and making it back home. (Phew!). Ok, time to head to the hospital . . .